The First World War shattered not just lives but also perceptions of the ‘natural order’ of things across Europe and how it was ruled. One response post-1918 was to go to extremes, and as Russia turned to Communism another response was to Fascism, which created some rather strange bedfellows when it came to supporters of the movement, as a large poster sold at Shropshire saleroom Mullock's (17% buyer's premium) on May 22 reveals. Measuring 2ft 6in x 19½in (76 x 50cm) and picked up by the vendor in a flea market, it nearly doubled the top estimate to take £1300 from an online buyer. 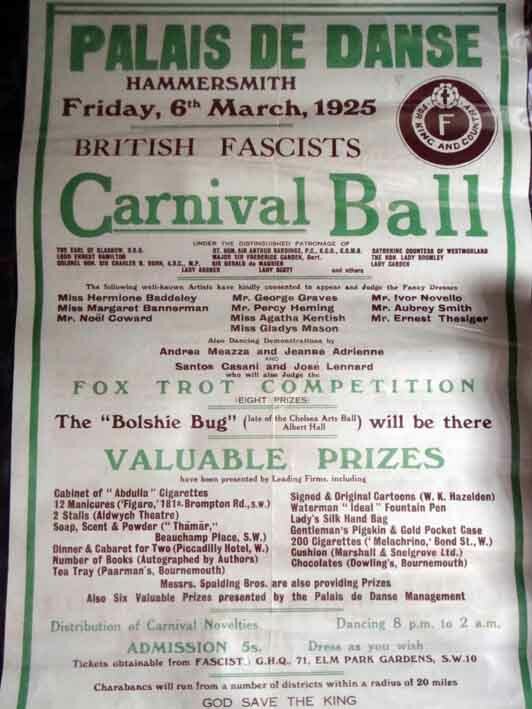 The green and brown design advertised the British Fascists' Carnival Ball at the Palais de Danse in Hammersmith, west London, on Friday, March 6, 1925. Prominent among the names mentioned as artists who have "kindly consented to appear and judge the Fancy Dresses" is a certain Noël Coward (1899-1973). It is therefore somewhat ironic that when the Nazis created their notorious 'black book' containing names who would be targeted for automatic arrest (and presumably execution) right after the invasion of Britain, who should be on that list but... playwright Noël Coward. While mentioned on the poster are patrons such as The Earl of Glasgow, Lord Ernest Hamilton, Sir Arthur Hardinge, Gerald Du Maurier and Lady Scott, other artists involved in the judging include composer and actor Ivor Novello and actor Ernest Thesiger (a cousin of explorer Wilfred), who, as homosexuals - like Coward - would not have fared well in a Nazi Britain. Another artist featured, opera singer Percy Heming, had a son who was killed at El Alamein in 1942. But the period after the horror of the Great War was a confusing time politically for so many and during the Second World War Coward was famed for supporting the British cause by work such as the propaganda film In Which We Serve (1942). Hammersmith Palais de Danse was a tram shed turned into an entertainment venue in 1919 and, many years after Fascist balls, became famous for gigs from the likes of the Rolling Stones and David Bowie. Now demolished to make way for student flats, it was immortalised in The Clash song White Man in Hammersmith Palais (1978) - a far cry from Fascism, written about a reggae all-nighter at the venue. British Fascism thankfully failed to take hold, partly because of unfavourable reaction to the British Union of Fascists (BUF) rally of June 7, 1934, held a stroll away from the Palais at London's Olympia complex, in Hammersmith Road, and attended by 12,000. Mullock's sold a copy of the souvenir programme for that rally for £160 (estimate £100-150) in March 2012. £80-100). About 3000 BUF members acted as stewards for that rally and were issued with badges in six different colours. Each colour was worn by 500 stewards and it denoted a section of the hall for which they were responsible.